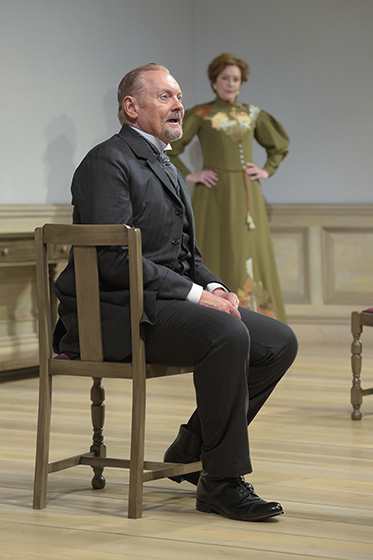 Now she’s knocking on that same door in Lucas Hnath’s 2017 “A Doll’s House, Part 2,” presented by Berkeley Repertory Theatre in a co-production with Huntington Theatre Company. 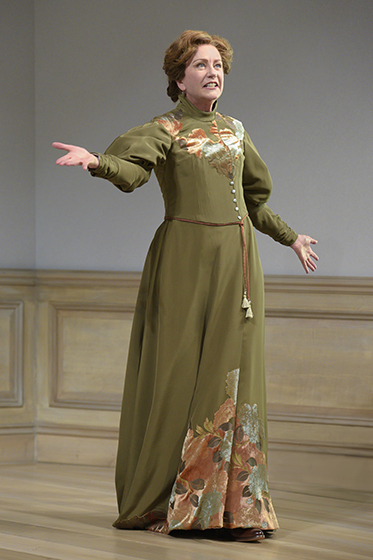 Nora (Mary Beth Fisher) returns home. Elegantly dressed, Nora (Mary Beth Fisher) has become a successful writer of pro-feminist, anti-marriage books though she uses a pseudonym. She has returned because she has recently learned, contrary to her assumption, that her husband, Torvald (John Judd), hasn’t filed for divorce. Without a divorce, she faces legal trouble. However, if Torvald does file for divorce, he faces his own problems because he had allowed people to assume she had died. Caught in the middle is Anne Marie (Nancy E. Carroll), who served as nanny to Nora and then to her three children. She still lives in the Torvald home even though the children have grown up and left. Finally, the Torvalds’ daughter, Emmy (Nikki Massoud), is a foil to Nora because she is eagerly looking forward to being married. None of those left behind can understand why Nora left and why she never contacted them afterward. Except for Massoud as Emmy, who talks too fast, director Les Waters guides the actors through finely nuanced performances covering a range of emotions. Playwright Hnath never tips his hand on where everything will lead until the very end, keeping the audience enthralled. All of this is accomplished on a spare set by Andrew Boyce with handsome period costumes by Annie Smart. The lighting is by Yi Zhao with sound by James Ballen. One of his subtle touches is Carole King’s “It’s Too Late,” heard just before the play begins. Running about an hour and a half without intermission, “A Doll’s House, Part 2” will continue through Oct. 21 in Berkeley Rep’s Roda Theatre, 2015 Addison St., Berkeley. For tickets and information, call (510) 647-2949 or visit www.berkeleyrep.org.